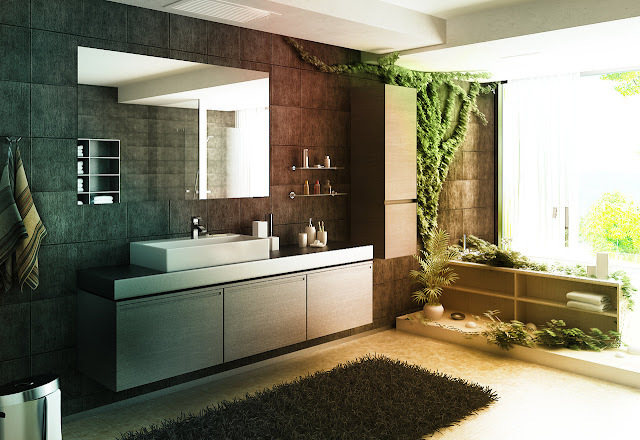 Creating an Eco-friendly bathroom may sound like a daunting task, but it truly isn’t so. When you need to purchase items for your bathroom, simply consider a greener alternative. Little changes will add up to a big difference over time! We’ve thought of ways that you can make a more eco-friendly bathroom. Are you ready to get started? 1. Several items not just in our bathroom come in plastic wrapping. Unfortunately this type of plastic is not biodegradable and can actually last for centuries in our landfills. Due to their light weight, plastic bags also often end up in oceans and water systems where they are toxic to our sea life. The plastic that your toilet paper comes in, for example, can be recycled in the same manner as plastic grocery bags. If you don’t absolutely need that plastic bag to transport your belongings, decline it at the point of purchase. And if your items come packaged in a plastic wrapping, put it in one of those recycle bings the next time you are at the supermarket. 2. From packaging of products like soap to the cardboard rolls inside the toilet paper, there is plenty of paper in the bathroom that can be recycled. Making new paper from recycled paper reduces the related contribution to air pollution by 95%. 3. Recycling all of our your shampoo bottles and other plastic bottles and containers. For every ton of plastic bottles recycled, we could save the equivalent energy usage of a two-person household for an entire year. 4. Don’t forget the glass bottles in your bathroom too, particularly those used for cosmetics. More than 28 billion glass bottles and jars end up in landfills every year, but recycling just one glass jar saves enough electricity to light a 100-watt light bulb for four hours, power a computer for 30 minutes, or keep a television on for 20 minutes. 5. According to EcoLife.com, “Disposal of consumer products, including things like medicines, personal care products, and makeup, is now the primary cause for contamination of fresh and ocean waters in industrialized nations, especially since water treatment plants are unable to break down the majority of the toxins that we put into them.” Look here for information on how to safely dispose of your medicines. 6. Want to get better about recycling items in the bathroom? Put a small waste basket in your bathroom(s) just for recyclables! 7. Does your house get a lot of light during the daytime? If so, then there’s no need to turn on the lights each time you go into the bathroom. Most of us just do it out of habit, when it really isn’t necessary at all. 8. Set a timer for your kids when they shower or bathe. Kids are often the culprits of wasted water, especially since they don’t pay the water bills! 9. Use Eco-friendly personal care products too. There are tons of eco-friendly brands to choose from, and not only will they be better for the environment, they will be better for YOU too.